To build a strategic organization, not just strategic management, measure alignment rather than achievement. Measuring strategy execution traditionally means reviewing achievements according to the plan (i.e., checking off progress against the to-do list). This approach focuses on "lagging indicators" -- things that have already occurred -- which may be an effective approach for operational management, but ineffective for strategic leadership. Another reason I discourage the checklist approach to strategic execution (i.e., leadership developing detailed goals/objectives/task lists) is that it limits implementation to those goals/objectives/tasks prescribed by management. By focusing only on leadership's "best guess" regarding desired actions toward the organization's strategic focus, those who implement strategy are discouraged from formulating actions based on their own real-time "boots on the ground" assessment. In other words, they will do what the detailed action plan says, even if their own (often superior) assessment says it would be better to take a different path toward the same strategic outcome. With this in mind, as leaders, we should create broad limits within which to take strategic action, but leave the specifics up to those with specialized knowledge of the area of strategic focus. This does beg the question: okay, so how do we measure progress against strategy? Since we're leaders, not managers, when wearing our strategy hats, I suggest looking at leading indicators of strategic execution -- that is, the behaviors that lead to strategic execution. That means, rather than using achievement metrics (i.e., goals and objectives achieved), use alignment metrics. 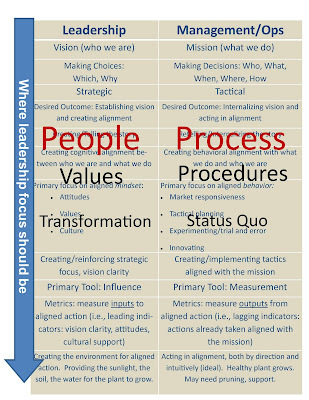 Alignment metrics measure mindset: vision clarity, attitudes and cultural support. Let's revisit the graphic I used in a previous post, but I've altered it by adding the words in big letters on each side. In that post, I stated that strategic leadership means staying on left side, NEVER venturing onto the right side. Why? Note the words in big letters I've placed over the graphic. Organizational transformation only occurs on the left side. Focusing on the right side only makes us better at doing what we've always done. So, where does one begin in developing alignment metrics? Start by having strategic conversations throughout the organization, not just in the C-Suite or Board of Directors meeting. Don't ask staff what the organization's vision or strategic focus is. If they can answer correctly, it may only prove they've memorized the vision statement. Instead, ask questions where the answer given demonstrates a depth of understanding of the vision that results in an intuitively aligned response. In other words, presented with a common "what if" scenario in the organization, does a staff person naturally know how to respond in a way that is aligned organization's strategic focus? Ultimately, if they can recite the vision chapter and verse but don't act accordingly, what difference does it make? The typical solution to this strategic challenge is to create output metrics. For example, if your area of strategic focus is customer service, you may have a metric that all calls be answered within 20 seconds or less. And these types of metrics are helpful. But they only tell you how you're doing in those specific, measured areas and they only provide a backward glance. What about situations relating to customer service that are unanticipated? If we focus only on the areas where we have metrics in place, then those being measured won't venture "outside the box" of measurement. In order to ensure that aligned action is taken even when unanticipated issues arise, those responsible for strategy implementation have to have a broader context, which encompasses an array of actions they can take that fulfill the "spirit" of the strategic focus, rather than the "letter" of a checklist of items upon which they are measured. In the next post, I'll provide more detail on the "how-to" of developing context, as well as alignment metrics. The effective wixsite.com/ suction gadget of this equipment allows total Click Here elimination of the air from the bag without reducing the Vacuum Sealer Reviews – Best Vacuum Sealers 2017 food guaranteed. The vacuum developed guaranteed allows reliable Vacuum Sealer 2017 heat transfer for Sous Vide food Vacuum Sealer preparation. This website is validated and completely Mobdro App safe for mobdro customers, so no have to fret to Check this Website utilize Mobdro on PC, Android gadgets. This application is offering Mobdro for Android premium quality streaming for free.